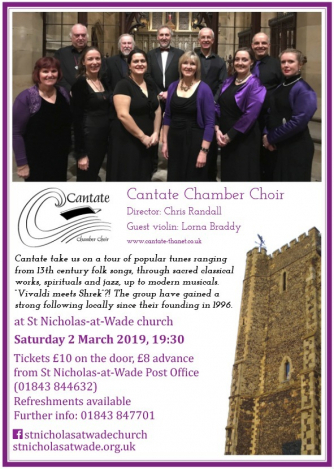 A welcome return to St Nicholas at Wade Church for this popular local chamber choir. Cantate - who last visited in September 2016 - will be entertaining with their usual wide range of music to suit all ages. Refreshments will be available for a donation. Further information may be found on Facebook, or http://bit.ly/StNickNews (for those not on Facebook).